Well over half the world’s population lives in Asia Pacific, and demand for healthcare there is correspondingly great. Currently, access to quality healthcare—in particular, modern medical technology, or medtech—is difficult for many patients. Healthcare demand already outstrips supply in Asia Pacific, and the gap will grow in line with continued increases in income, population, disease burdens, and general awareness of health issues. The region’s healthcare needs reflect its size and growth projections, and the Asia Pacific medtech market is expected to rise to about US$ 133 billion a year in 2020, from about US$ 88 billion a year in 2015. Asia Pacific is a complicated collection of individual markets, often with little in common other than a shared continent. Political systems, economic development, cultural traditions, and disease profiles, among other characteristics, vary widely from one country to the next. By 2020, Asia Pacific is expected to surpass the European Union as the world’s second-largest medtech market (after the United States), and the majority of customers will lie beyond the premium segment. To reach these patients and defend against new competitors, global companies will have to rethink their approach to the region, creating new business models that encompass multiple channels, developing market-appropriate products rooted in innovation, allowing greater local autonomy, and removing structural barriers. 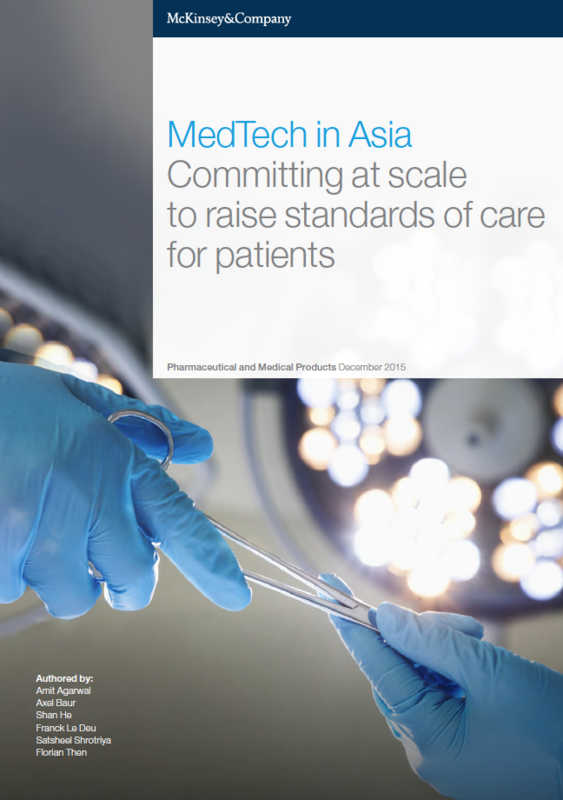 Source: McKinsey “MedTech in Asia: Committing at scale to raise standards of care for patients”, December 2015.